Join us for a variety of fitness events across the region as part of Active April. We’re getting moving to help with our physical and mental health. We know that absenteeism costs businesses £29 billion each year and stress is the main cause of absenteeism. Exercising releases endorphins in the brain and helps with our mood. 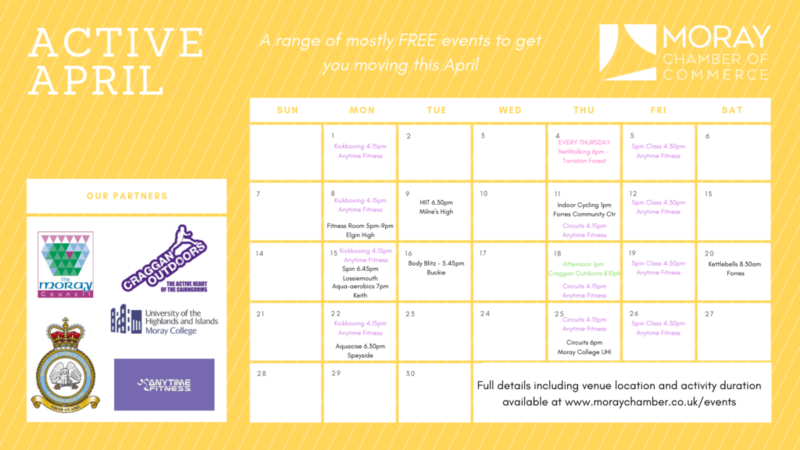 We want to invite you and your staff to come along to as many activities as possible throughout April. Perhaps to try something new, to meet new people, but most of all – to get moving! Monday 8th April – Fitness Room Session – 5.00pm – 9.30pm – Sports Centre, Elgin High School – Just turn up! Monday 22nd April – Aquacise – 6.30pm – Speyside Sports & Community Centre – Just turn up! Thank you to Craggan Outdoors, Anytime Fitness, Moray College UHI and Moray Council for offering these activities to our Chamber members, their colleagues and friends. WATCH THIS SPACE FOR A MILITARY TRAINING SESSION – COMING SOON!